A 5mm x 2mm hand forged comfort fit band (domed on the inside for comfort) in recycled argentium sterling silver and given a brushed finish. This can be made to order in any size 7 - 13 (including half sizes) and will be made especially for you and shipped out within 5 weeks, please leave your size in notes to seller when you check out to make sure there are no delays. Also available in dark oxidized, or shiny finish. Argentium sterling silver is an alloy that replaces some of the copper found in sterling silver with germanium to give it more resistance to tarnish. All jewelry comes suitably packaged for gift giving. Everything you see here is made by me in my messy and hectic home studio. Love the ring, the brushing on it looks so cool. Wonderful seller to work with, and beautiful design! Custom orders must be paid in full before I can begin work on them. None of my rings are plated and all of my metal is purchased from reputable and ethical suppliers. I guarantee my work and will gladly refund the cost of a *ready to ship* item for any reason within 7 days of receipt. The item must be returned in unused condition and it is the responsibility of the buyer to pay return shipping. Rush orders can absolutely not be refunded. As a rule, custom orders are not refundable as the metal or size you require may not be something I could ever sell again. Some custom orders may be partially refunded on a case by case basis. I want you to be happy with your jewelry, please contact me with any concerns and I am sure we can work something out. 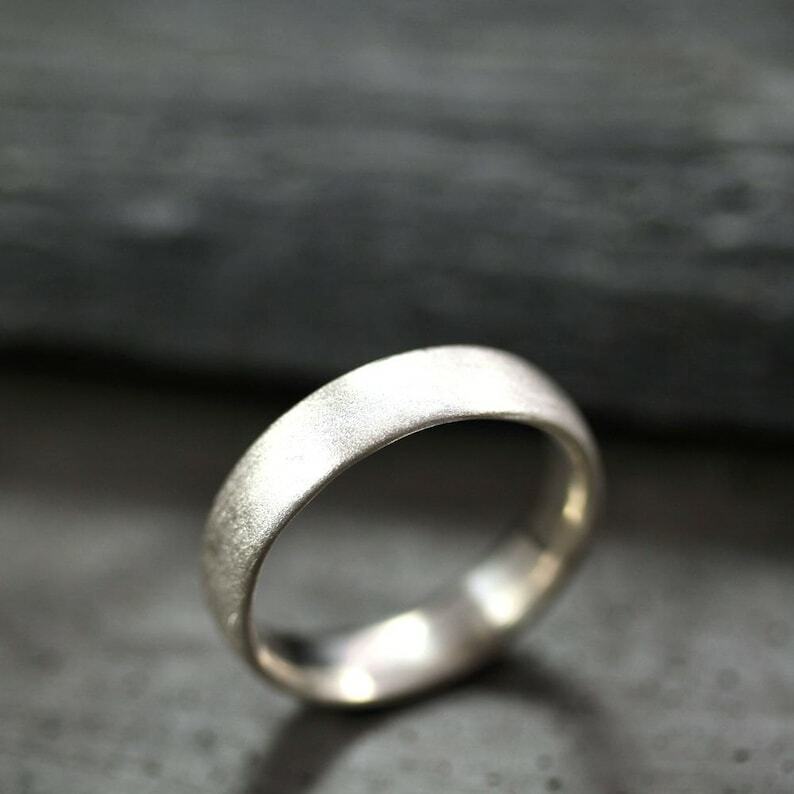 If you have ordered the ring in the wrong size there will be a resizing fee which varies depending on the metal and how complicated the ring is. I don't keep a stock of rings on hand and make each one in your size when you order. I package my items very carefully and would hope that the buyer would return them as well packaged. If you have a problem that is not addressed in the above, please feel free to contact me, I will do my best to help if I can. I know the stress and pressure that wedding planning can cause and I want to be one of the things that you can cross off your list and not worry about. I am just one person and am ordering supplies, making rings, answering convos and trying to stay on top of wedding dates so I am not able to regularly send status updates as to how each ring is going. The scheduled to ship by date on your order will be the absolute latest I would send it out (or whatever date we've already discussed). I use the Etsy address as the shipping address. Please make sure your shipping address is up to date. I try to ship Ready to Ship items within 5 days of successful payment through USPS Priority Mail with delivery confirmation in the US. If your item is made to order it will ship out within five weeks of successful payment and getting the ring size. If you need your jewelry faster, please contact me to discuss shipping upgrades. Orders over $250 within the US will come with Signature Confirmation. Orders out of the United States can take up to 8 weeks to arrive and your parcel may be subject to duties and custom fees, these are the responsibility of the buyer. It is illegal for me to mark merchandise as a gift on the customs form. Contact your local post for more information. International orders over $75 ship USPS registered mail so a tracking number can be provided for both of our benefits. There is no such thing as a perfect ring size. Fingers swell in the summer, get skinnier in the cold, they bloat along with you and lose weight when you do. Just as your pants don't fit the same every day, neither does your ring. If you were last sized a few months ago, your size may have changed. There is no industry standard for ring sizers, either, different brands of sizers may give you different results. I am always happy to send out a free ring sizer (that coordinates with the tool I use to make the rings) before or after you order your ring so you can be sure of the size. Ring sizers are made of plastic so will be more malleable and thinner than your real band,so if you are between sizes, bigger is often better. If there is a sizing error on my part, I am happy to pay for shipping back to me and will resize your ring for free along with my apologies. If the sizing error was on your part, I am still more than happy to resize the ring for a fee. I take all of my pictures in natural light and try to get the truest colors I can. Individual monitor settings may vary. Stones look their best in natural light and some are very reactive to sunlight (sunstones, chalcedony, carnelian). What may appear a duller color indoors will glow in sunlight. I don't do engraving, but I do make my rings as smooth on the inside as human hands can so they will be ready to be taken locally to engrave. My rings are all made by hand by me and I make each ring with quality and beauty in mind, however they will not have the cold perfection of a machined ring like you would find in a commercial jewelry store. If you are expecting a handmade ring, you will be happy. If you are expecting a machined band like in commercial jewelry stores, this may not be the shop for you. I hope you will find the perfect ring. Sterling silver is 92.5% pure silver and 7.5% copper. People with copper sensitivity may experience skin discoloration from wearing sterling silver rings. Gold is alloyed with copper and may cause discoloration on a very few people. If you are highly reactive with copper contact me for other metal options. The oxidation on sterling silver is not permanent and will wear out uniquely with each owner like a pair of jeans. Silver oxidizes naturally and what I do is a forced tarnish, it goes down a few layers into the silver like a suntan. Left to its own devices, it would stay dark, but people don't stand still, so where the ring bumps up against things, the silver will brighten and then darken again with time. The end result is that the ring will always be in flux, alive and changing. If you are looking for a black ring that will never change, then oxidized is definitely not for you. If you'd like me to touch up the finish on your ring, there is no fee, just let me know.